Introduction: When evaluating the cost of a lifesaving operation, one must consider the economic value, which can be defined as the relative cost per additional year of life lived. This evaluation might provide useful information for the application of costly procedures. The objective of this study was to determine the cost per year of life saved for the costliest operations performed at an urban academic medical center. Methods: Total hospital expenditures were categorized by diagnosis related group (DRG) between January 1, 2015 and December 31, 2016. Average cost and patient age for each procedure were calculated. Average lifespan following successful outcome was determined based upon published benchmarks. Cost per year of life saved was calculated for each procedure. Only those elective procedures necessary to prolong life and enhance health were analyzed. Results: 114,448 hospital admissions were reviewed. The 12 costliest procedures were identified and ranked according to cost per year of life saved: Coronary bypass ($1,345.45), portacaval shunt procedure ($2,261.70), cardiac valve/other major cardiothoracic procedure ($2,733.78), major bladder procedure ($2,733.78), cardiac defibrillator implant ($5,047.65), bone marrow transplant ($5,181.80), intracranial vascular procedures ($8,572.05), kidney transplant ($9,024.87), liver transplant ($11,112.73), endovascular cardiac valve replacement ($12,842.25), simultaneous pancreas/kidney transplant ($14,087.50), and heart transplant ($20,472.11). Conclusion: Among the costliest procedures, coronary bypass was the most economic, having the lowest cost per year of life saved ($1,345.45) and longest post-procedure life expectancy (17.6 years). These findings combined with further analysis of the identified procedures may allow us to better determine their relative value. As healthcare expenditures continue to grow and new efforts are introduced to increase the value of care provided to patients, it might be important to examine the cost-effectiveness of various medical interventions. According to the Centers for Medicare and Medicaid Services (CMS), U.S. healthcare spending increased 4.3 percent to reach $3.3 trillion, or $10,348 per person in 2016. The overall share of gross domestic product (GDP) related to health care spending was 17.9 percent in 2016, up from 17.7 percent in 2015 . By 2025, healthcare expenditures are expected to account for approximately 25% of the U.S. economy, which may or may not be sustainable. Furthermore, aggregate surgical expenditures alone are expected to grow from $572 billion in 2005 (4.6% of US GDP) to $912 billion (2005 dollars) in the year 2025 (7.3% of US GDP) . In the context of global health, it has been recommended that cost-effectiveness for surgical procedures, as well as burden of disease and the success of surgical intervention, be considered when prioritizing various surgical interventions in low income countries . The burden of surgically treatable disease within developing countries has grown substantially and thus requires an evaluation of a wide range of surgical interventions to determine their capacity to improve global health . While the decision to perform a given procedure is of course based upon medical decision making and not economic rationale, it is important that healthcare organizations consider cost effectiveness when deciding whether to offer certain operations overall. Cost evaluations for lifesaving procedures often assess the cost of performing the procedure itself, post-acute care, and any associated hospital expenses. However, one must also consider the economic value and impact of a particular procedure. One way to assess economic value might be to calculate the relative cost of a lifesaving procedure per additional year of life lived following the procedure. The objective of this study was to determine the cost per year of life saved for the costliest complex elective surgical procedures performed at an urban academic medical center. This evaluation could provide useful information for planning the application of these costly in-hospital procedures. The study protocol was reviewed by the Institutional Review Board of the Icahn School of Medicine at Mount Sinai and determined to be exempt. Data for this study were obtained from The Mount Sinai Hospital’s financial database. The cost accounting system combined the total hospital costs from the hospital general ledger with the patient utilization data from the billing system to calculate a unit cost for each service provided. Based on the services provided to a given patient, the system generated a cost to treat each patient. The database was then filtered to include only those patients that underwent an inpatient procedure between January 1, 2015 and December 31, 2016. Each surgical admission was categorized by diagnosis related group (DRG) and determined to be either an elective or non-elective surgical procedure. Elective surgical procedures were defined as any scheduled non-emergency procedures. All non-elective surgical encounter data were excluded. The elective surgical DRGs were then classified as either lifesaving or non-life saving procedures. A lifesaving procedure was defined as any surgical procedure with a proven survival benefit based upon published benchmarks (i.e. a patient’s projected life expectancy is improved after undergoing the procedure). All non-life saving procedures, defined as any procedure that did not prolong life, but rather improved quality of life, improved mobility, or reduced pain, were excluded from this analysis. The remaining data, which included all patient level encounter information for life-saving elective surgical procedures, were analyzed to determine the cost and frequency associated for each DRG. The total hospital expenditures, defined by the direct costs incurred by the hospital for a given inpatient encounter, were aggregated for each DRG and divided by the number of cases assigned to that DRG, yielding an average hospital cost per case for each of the identified procedures. These direct costs covered any hospital expense associated with a patient encounter (e.g. operating room time, nursing, ancillaries, supplies, implants, complications, etc.). 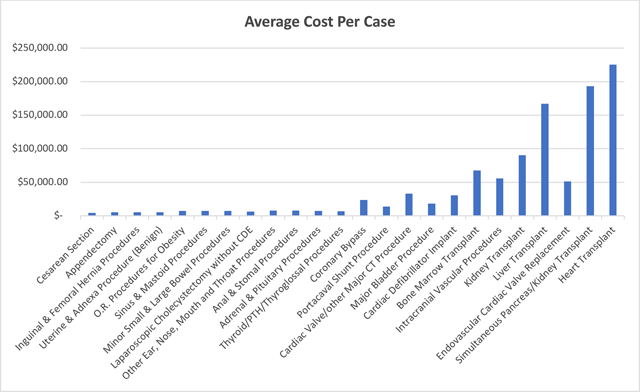 Based upon the average cost per case, the 12 most expensive life-saving elective procedures performed at the hospital were determined and ranked. For each of these costly procedures, the average number of years saved was calculated from the age of the patient and their projected lifespan following successful post-operative outcomes based upon published benchmarks for that particular procedure (Table 1). For procedures that resulted in return to the average life expectancy of a healthy individual, the average years saved was calculated from the age of the patient and the average U.S. life expectancy, which is 78.8 years according to the Centers for Disease Control and Prevention from 2016 . In the event that average patient age for a particular procedure exceeded average U.S. life expectancy, projected lifespan following that procedure was determined based upon published benchmarks. Most Costly Elective Invasive Procedures. Ranking of the 12 most costly elective invasive procedures based on the cost per year of life saved for each procedure. Cost per year of life saved is defined as the procedural cost distributed across each additional year of life lived following the procedure. Using the average cost per case and the number of additional life-years post-surgery, the average cost per year of life saved was calculated for each procedure. Procedures were then ranked from most economically valuable to least economically valuable, where increased value was defined as a lower cost per year of life saved. Procedures were also ranked according to their respective average cost per quality adjusted life-year (QALY) saved, providing an alternative measure to assess economic value. Quality of life utility scores were derived from the current literature (Table 2). *QALY = Quality adjusted life year. Ranking of the 12 most costly elective invasive procedures based on the cost per quality adjusted life-year (QALY) saved for each procedure. Cost per QALY saved is defined as the procedural cost distributed across each additional QALY lived following the procedure. To provide a context for this analysis, the average cost per year of life saved was also calculated for the hospital’s 12 most inexpensive lifesaving procedures (i.e. those procedures with the lowest average cost per case). There are many other elective lifesaving surgical procedures that were not among the most costly nor inexpensive that were not included in this analysis. 114,448 hospital inpatient admissions from January 2015 to December 2016 were reviewed. 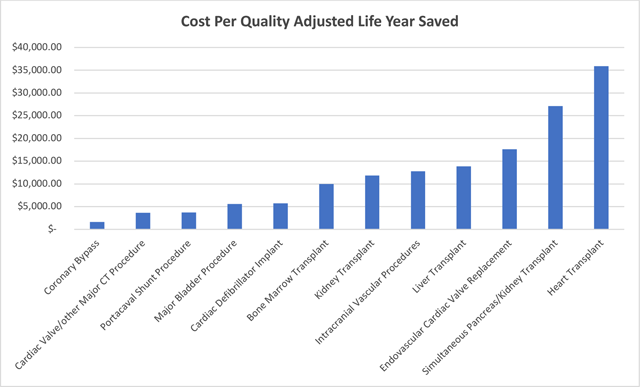 Based upon the calculated average cost per case, the 12 most costly elective lifesaving procedures were identified and ranked according to their calculated relative cost per year of life saved (Table 1) and cost per quality adjusted life-year saved (Table 2). The costs per year of life saved ranged from $1,345.45 to $20,472.11 and costs per quality adjusted life-year saved ranged from $1,621.01 to $35,915.98. The expected additional years of life lived per procedure ranged from 4 years (2.92 QALYs) to 17.6 years (14.61 QALYs) based upon recent large published series for these particular procedures. These procedures were ranked from most economically valuable to least economically valuable, where the lowest cost per year of life saved, or QALY saved, represented the greatest economic value. Among the identified costly procedures, the procedure with the greatest value was coronary bypass and the procedure with the least value was heart transplant. The hospital’s most inexpensive lifesaving surgical procedures were also ranked from most economically valuable to least economically valuable based on their respective cost per year of life saved (Table 3 and Figure 1), which ranged from $92.14 (cesarean section) to $267.29 (thyroid, parathyroid, and thyroglossal procedures) (Figures 2 and Figure 3). Least Costly Elective Invasive Procedures. Ranking of the 12 least costly elective invasive procedures based on the cost per year of life saved for each procedure. Cost per year of life saved is defined as the procedural cost distributed across each additional year of life lived following the procedure. Average cost per case for all evaluated elective lifesaving procedures. O.R. = Operating Room. CDE = Common Duct Exploration. PTH = Parathyroid. CT = Cardiothoracic. Cost per year of life saved for all evaluated elective lifesaving procedures. O.R. = Operating Room. CDE = Common Duct Exploration. PTH = Parathyroid. CT = Cardiothoracic. Cost per quality adjusted life year saved for all evaluated elective lifesaving procedures. CT = Cardiothoracic. 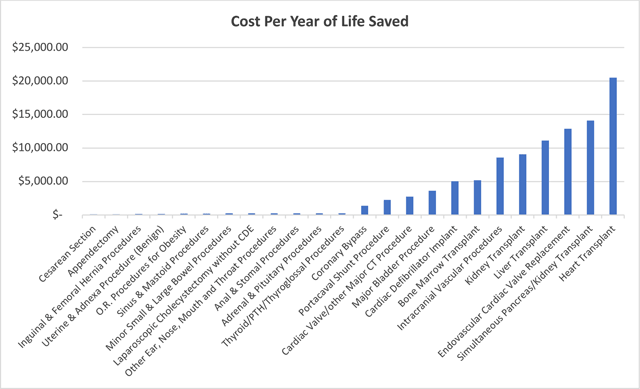 This retrospective economic study has identified the relative cost per additional year of life lived following some of the most expensive lifesaving procedures performed at an academic medical center. As value analysis is not a perfect science, this assessment evaluated each procedure in terms of two metrics – the cost per year of life saved and the cost per QALY saved, neither of which account for reductions in morbidity. Given that long-term outcomes data specific to Mount Sinai Hospital was difficult to obtain for many of the identified procedures, peer reviewed literature was utilized to estimate post-procedural life expectancies as well as quality of life utility scores. With the QALY metric, health outcomes include the additional years of life lived by the patient as well as the quality, or utility, of those additional years. QALYs are maximized by increasing a patient’s utility, which can be defined as the value placed in a particular health outcome along a continuum, where 0 represents death and 1.0 represents perfect health . Any values in between represent the degree to which a patient is experiencing disability or distress. Among the procedures investigated in this value analysis, the calculated economic value for certain procedures was limited by the fact that those procedures were performed on a predominantly elderly population. For example, endovascular cardiac valve replacement was associated with four additional years of life lived (and 2.92 additional QALYs), which proved to be the smallest life prolongation benefit. However, the average age of a patient undergoing endovascular cardiac valve replacement was 81 years old. Given that the average United States life expectancy is only 78.8 years, it is not surprising that this procedure offered the fewest additional years of life and a subsequently lower economic value when compared to the other costly lifesaving procedures . In the event that younger, healthier patients undergo this operation in the future, it is possible that the additional years of life lived, and consequently the relative economic value, for this procedure would increase. Furthermore, although cesarean section was deemed the most economically valuable overall, its value may have in fact been underestimated. To provide context, the present analysis took into account only the additional years of life lived by the patient (i.e. the mother); certainly, the economic value for this procedure should also be attributed to the additional years of life for the child. If the patient’s additional 45.5 years lived were combined with the 78.8 years life expectancy for the baby, the procedure would yield a total of 124.3 additional years of life and cost of a mere $33.71 per year of life saved. It is also important to consider the current literature surrounding the relative economic benefit for each of these identified costly procedures. In the case of coronary bypass surgery, its economic benefit has been measured against alternatives such as medical treatment and percutaneous coronary intervention (PCI). One such study examined the cost-effectiveness of coronary artery bypass graft surgery (CABG) vs. percutaneous coronary revascularization with drug-eluting stents (DES-PCI) in patients with 3-vessel or left main coronary artery disease. Investigators found that over a patient’s lifetime, CABG remained costlier than DES-PCI, but the incremental cost-effectiveness ratio (ICER) of $16,537 was favorable. The ICER represents the incremental cost for every additional QALY experienced by a CABG patient vs. a DES-PCI patient. For the majority of patients with 3-vessel or left main coronary artery disease, CABG was determined to have a greater clinical and economic benefit than DES-PCI. However, among patients with less complex disease (i.e. SYNTAX score <22), DES-PCI might be favored both clinically and economically . Regarding portacaval surgical shunt (PCSS), its long-term cost effectiveness has been measured against that of transjugular intrahepatic portosystemic shunt (TIPS) in patients with portal hypertension and cirrhosis. One study followed patients with early cirrhosis who had an upper gastrointestinal bleed despite medical therapy and underwent either TIPS or PCSS . The average cost per life-year saved was $17,771 (SD = 471) for TIPS and $21,438 (SD = 308) for PCSS. The average life expectancy was 5.0 years for TIPS and 7.0 years for PCSS, yielding an ICER for PC of $3,299 per life-year saved. It was thus concluded that portacaval shunt was the more cost-effective treatment strategy. With respect to the economic value of cardiac valve procedures, it is important to consider that several different valve-related surgical procedures must be taken into account. For example, one institution determined that the overall cost-effectiveness ratio for aortic valve replacement vs. standard medical treatment for aortic stenosis was $13,528 per QALY gained and that this ratio increased according to age at surgery (i.e. surgeries performed on older patients were less cost effective) . For octogenarians and nonagenarians, the costs per QALY gained were $19,826 and $27,182, respectively. The PARTNER trial, which randomized patients with symptomatic, severe aortic stenosis who were not candidates for surgery to transcatheter aortic valve replacement (TAVR) or standard therapy, was analyzed to determine the incremental cost-effectiveness of TAVR . Relative to standard therapy, TAVR increased life expectancy by 1.6 years (1.3 QALYs) at an incremental cost of $79,837, yielding an ICER of $50,200 per year of life gained and $61,889 per QALY gained, falling well within accepted values for accepted cardiovascular technologies. Furthermore, economic models regarding mitral valve procedures have determined that the average cost over 10 years following a mitral valve repair was significantly lower (p < 0.01) than that of biologic or mechanical valve replacements ($48,041, $68,881, and $73,830, respectively). However, once expanded to a 20-year timeframe, costs per successful outcome were significantly lower (p < 0.01) for mechanical valve replacement compared to either mitral valve repair or biologic valve replacement ($128,058, $135,207, and $199,303, respectively) . Major bladder procedures for cancer encompass several different surgical operations, and consequently, most economic assessments of bladder procedures pertain to the surgical treatment for a specific disease. For example, the cost effectiveness of immediate cystectomy relative to conservative therapy with intravesical Bacillus Calmette-Guerin (BCG) in patients with high-risk, T1, grade 3 (T1G3) bladder cancer has been evaluated . Immediate cystectomy and BCG therapy resulted in a quality adjusted survival of 9.46 QALYs and 9.39 QALYs, respectively. Furthermore, lifetime costs per patient (in 2005 dollars) were $30,080 for immediate cystectomy and $33,920 for BCG therapy. Thus, for average patients with high-risk, T1G3 bladder cancer, immediate cystectomy was the more economic treatment option. However, for patients aged >75 years and those with significant comorbidities, BCG therapy was more cost effective. The economic value of cardiac defibrillator implantation (ICD) has been measured relative to alternative therapies. Through the assessment of eight randomized trials intended to determine whether ICDs improved survival among patients who had not yet had a life-threatening ventricular arrhythmia, but were at risk for sudden death due to left ventricular systolic dysfunction, the cost-effectiveness of the implantable cardioverter-defibrillator was assessed . Although two trials found that ICDs did not reduce the risk of death and were also more expensive and less effective than control therapy, the other six trials found that ICDs resulted in an additional 1.01 – 2.99 QALYs and $68,300 – $101,500 in cost. The cost-effectiveness of the ICD relative to control therapy in these six trials ranged from $24,500 – $50,700 per life-year gained and $34,000 – $70,200 dollars per QALY gained. The economic value of bone marrow transplant (BMT) has been measured against that of conventional chemotherapy for a variety of hematological malignancies. One study assessed the economic benefit of allogenic BMT and determined that for patients with acute myeloid leukemia in second complete remission, the incremental cost (in 1992 dollars) per life-year gained by BMT vs. standard therapy was $23,360 and per QALY gained $50,720 . For patients with acute lymphoblastic leukemia in first complete remission, the incremental cost (in 1992 dollars) correlated with an added cost of $23,360 per life-year gained by BMT and an added cost of $72,000 per QALY gained. Consequently, for acute myeloid leukemia patients in second complete remission, BMT had better outcomes, but was costlier. For acute lymphoblastic leukemia patients in first complete remission, costs and outcomes were similar for both BMT and standard therapy. Intracranial vascular procedures represent a group of several different surgical operations. Thus, its economic benefit is often assessed with respect to any one of the individual procedures within the group. For example, in patients with ruptured intracranial aneurysms, the cost per QALY was $65,424 for endovascular treatment and $64,824 for neurosurgical treatment. At one year, the estimated ICER for endovascular treatment versus neurosurgical treatment was $72,872 per QALY gained. This ICER was expected to decrease over time, and possibly reverse, as most post-procedure angiograms and additional treatments occurred in the first year and the one-year disability status was unlikely to change in the future . Kidney transplantation serves as an example of savings that can be realized as a result of a single surgical intervention compared to ongoing alternative therapies. Investigators have determined that relative to renal dialysis, kidney transplantation was associated with decreased cost, increased QALYs, and decreased mortality . Over a five-year timeframe, the cost per QALY for transplantation and dialysis were $25,744 and $36,615, respectively. Had the research timeframe been extended beyond five years, the economic benefit of transplantation would be even greater. Regarding the cost-effectiveness of simultaneous pancreas/kidney transplant, one study evaluated kidney-alone transplant from a living-donor (KA-LD) followed by pancreas-after-kidney (PAK) and simultaneous pancreas kidney (SPK) transplant in type I diabetic patients with end-stage renal disease. The projected 5-year cost was $277,638 for KA-LD + PAK and $288,466 for SPK. The cost per QALY was $153,911 for KA-LD + PAK and $110,828 for SPK . Therefore, KA-LD followed by PAK was less cost-effective than SPK as a treatment strategy for a type I diabetic with end-stage renal disease. The economic benefit of liver transplantation has been evaluated for both cadaveric and living-donor transplants. For patients with end stage liver disease, programs offering cadaveric orthotopic liver transplantation (OLT) resulted in an additional $188,693 in lifetime costs and 6.2 QALYs compared to conservative treatment, while programs offering both cadaveric and living-donor OLT resulted in an additional $230,688 in lifetime costs and 7.5 QALYs compared to conservative treatment . The marginal cost-effectiveness of each program was similar ($30,338/QALY gained for cadaveric OLT alone and $31,797/QALY gained for cadaveric plus living-donor OLT). Finally, orthotopic heart transplantation (OHT) value has been compared to that of inotrope-dependent medical therapy (IDMT), bridge to transplant-left ventricular assist device (BTT-LVAD), and LVAD implantation as destination therapy (DT-LVAD) for transplant-ineligible patients. One study concluded that OHT increased life expectancy to 8.5 years and cost an additional $97,000 per QALY gained, relative to IDMT . Compared to OHT alone, BTT-LVAD followed by OHT further increased life expectancy to 12.3 years and cost an additional $226,000 per QALY gained, falling outside of standard cost effectiveness limits. For OHT-ineligible patients, DT-LVAD cost an additional $202,000 per QALY gained or $132,000 per life-year gained, compared with medical therapy. Clearly, many economic analyses have compared the cost effectiveness of a given procedure to that of some alternative treatment. While these types of analyses are certainly useful in assessing the relative value of different procedures to treat a specific disease state, they fail to examine healthcare institutions overall with respect to where the most dollars are spent and the value of those dollars that are spent. By identifying the costliest procedures within a particular hospital as well as which procedures are the most and least “valuable,” this analysis can help institutions identify where to direct cost saving efforts and how to conduct an economic value analysis of their own. It is imperative that hospitals understand the economic drivers of their cost ineffective procedures so that they are better equipped to identify opportunities for improvement. This type of value analysis also empowers healthcare institutions to make more informed decisions regarding which procedures they wish to perform from an economic perspective. It is possible that while some hospitals may be able and willing to offer these costly procedures to their patients, other hospitals may not. Knowing the cost as well as the “value” of some of the most expensive procedures can help institutions make these types of decisions based on the needs of their community as well as their available resources. There were several methodologic limitations to this analysis. Results were based entirely from the hospital’s financial database and were not risk adjusted, potentially impacting procedural costs and number of additional patient life-years. Some of these risk factors include patient age, comorbidities, case complexity, gender, socioeconomic status, and pre-procedure health status. For example, in the case of kidney transplantation, longer waiting times on dialysis negatively impact post-transplant graft and patient survival . Similarly, increased time on the heart transplant waiting list is associated with greater odds of graft failure following transplantation . In addition, this study only included inpatient costs and did not take post-discharge treatments such as rehabilitation, outpatient care, and loss of time until return to work into account. Post-procedure productivity was also excluded from this value analysis, but it should be noted that one’s ability to return to work, as well as one’s productivity upon returning to work, varies significantly between procedures. One study found that among PCI and CABG patients that were employed pre-procedure, employment rates >12 months post-procedure were 85% for PCI patients and 62% for CABG patients . With respect to organ transplants, it was found that employment rates for kidney, heart, and liver transplant patients (59%, 44%, and 38%, respectively) were lower than that of the general population (62%) . Furthermore, although a large proportion of kidney transplant recipients return to work, approximately 30% of those individuals still receive disability benefits, indicating decreased productivity . A potential next step for this analysis might be to examine the reimbursement data for each of the identified costly procedures. Calculation of the differences between incurred costs and true reimbursements across invasive procedures would undoubtedly be of interest to hospital administrators as it would not only identify the costliest or least valuable procedures, but also those procedures that are actually losing money for the hospital. Assessment of procedural profit margins would certainly impact institutional efficiency strategies and possibly reimbursement negotiations with payers. Ultimately it is important to know the economic outcomes of the care that is provided to patients. Analysis of the costliest procedures with respect to post-procedural years of life saved serves as one way to assess value, and may be helpful in focusing the efforts of healthcare institutions that seek to improve procedural cost effectiveness. Among the costliest elective invasive procedures, coronary bypass surgery was the most economic. In addition to having the lowest cost per year of life saved ($1,345.45) as well as the lowest cost per QALY saved ($1,621.02), coronary bypass surgery also had the longest post procedure life expectancy (17.6 years). With a quality of life utility score of 0.83 (second only to cardiac defibrillator implant with a quality of life utility score of 0.88), coronary bypass surgery generated the greatest number of additional QALYs (14.61 QALYs). Among the least economically valuable procedures were cardiac transplant, which had the greatest cost per year of life saved and cost per QALY saved ($20,472.11 and $35,915.98, respectively) and endovascular cardiac valve replacement, which had the shortest post procedure life expectancy (4 years or 2.92 QALYs). These economic findings combined with further analysis of the identified procedures may allow us to better determine their relative value. National Health Expenditures 2016 Highlights. Centers for Medicare and Medicaid services. Retrieved from: https://www.cms.gov/Research-Statistics-Data-and-Systems/Statistics-Trends-and-Reports/NationalHealthExpendData/downloads/highlights.pdf. Fast Stats – Life Expectancy. Centers for Disease Control and Prevention. Retrieved from: https://www.cdc.gov/nchs/fastats/life-expectancy.htm last accessed December 28, 2017. Pierce DS, Sperry J and Nirula R. Cost-effective analysis of transjugular intrahepatic portosystemic shunt versus surgical portacaval shunt for variceal bleeding in early cirrhosis. Am Surg. 2011 Feb; 77(2): 169–73.